Persian Gulf – What Secrets Does it Hold? Climate Change: a great analysis as always. One point, if I may, is that no one really talks about the Persian Gulf, a shallow body of water, which most likely was dry land during the last Ice Age. Who knows what lies beneath, yet there is very little talk about exploring this area. REPLY: Oh you are very correct. The Persian Gulf is about 35 miles wide (56 km) at its narrowest, in the Strait of Hormuz. The Gulf is very shallow, with a maximum depth of 90 meters (295 feet) and an average depth of 50 meters (164 feet). 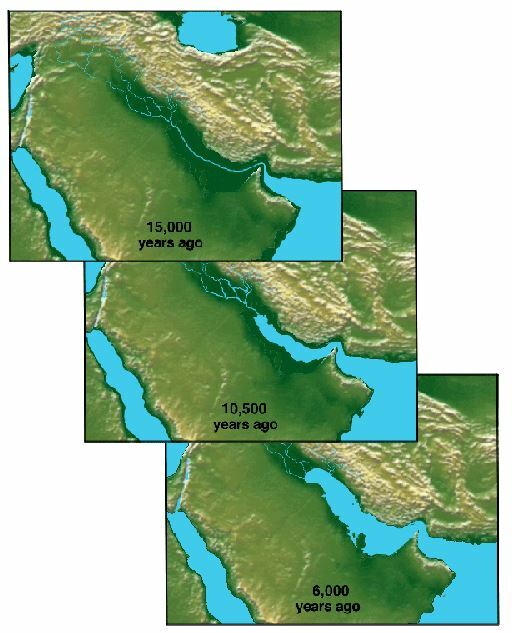 The Persian Gulf was fertile dry land before the flood, which obviously contains very old cultures which may be older than anything known on dry land today. We do know that the Gulf has receded from where it once stood in ancient times following the flooding. There is the legend of Dilmun (Telmun) that comes from Sumerian writings. This was an ancient Semitic-speaking city that is mentioned from the 3rd millennium BC onwards. 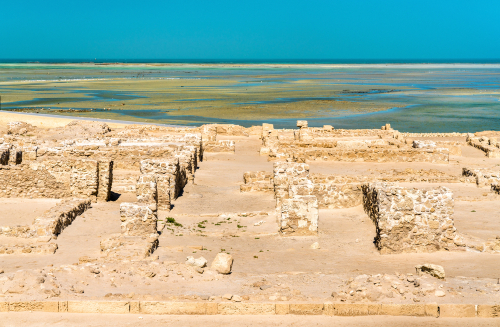 Based on the records that have survived, Dilmun was located in the Persian Gulf. It was on a trade route between Mesopotamia and the Indus Valley Civilization. Dilmun was a major trading center which controlled the Persian Gulf trading routes. Dilmun was mentioned by the Mesopotamians as a trade partner and the major source of copper. There are two official letters from Dilmun dated about 1370 BC that were recovered from Nippur, during the Kassite dynasty of Babylon. There was some administrative relationship between Dilmun and Babylon at that time. There is also an early inscription that mentions Dilmun and speaks of the tribute that they brought to Ur-Nanshe, the first king of the first dynasty of Lagash, which was an ancient city located northwest of the junction of the Euphrates and Tigris rivers. Lagash (modern Al-Hiba) was one of the oldest cities of the Ancient Near East. The surviving inscriptions say: “The ships of Dilmun from foreign lands, brought him (Ur-Nanshe) wood as a tribute.” Kassite dynasty conquered and controlled Babylon between 1531 BC and until c. 1155 BC. After their collapse, the only mention of Dilmun comes from Assyrian inscriptions dated around 1150 BC which proclaimed the Assyrian king to be king of Dilmun as well. Dilmun was a civilization that was quite an old civilization, yet because it appears to have been submerged in the Persian Gulf, it is much less famous than the four cradles of the civilization of the Old World, i.e. Mesopotamia, Ancient Egypt, the Indus Valley Civilization, and the Yellow River Civilization. In literature, Dilmun occupies an important place in the mythology of Mesopotamia since it is in the second half of the Epic of Gilgamesh. Additionally, Dilmun is also mentioned in the myth of Enki and Ninhursag / Ninhursaja. In this story, Dilmun is presented as a sort of earthly paradise. The flooding of the Persian Gulf has also been argued to be the origin of the story of Noah which follows the account of a flood in Gilgamesh.